Project Runway Season 14 winner Ashley Tipton designed FingerPaints' latest polish collection. Project Runway season 14 featured nails on the runway and as part of the grand prize package thanks to sponsor Sally Beauty. One of the perks of being named the winner was the opportunity to create a limited edition FingerPaints polish collection. When it was announced that Ashley Tipton took home the top honors, colorists everywhere rejoiced. 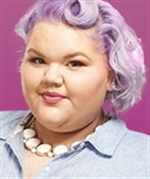 Tipton, whose violet hair almost matches one of the polish colors, made a name for herself this season by pairing fun colors with funky prints. Her FingerPaints collection is sure to not disappoint, as it contains shimmers, iridescents, and cream colors. Beverly’s Touch, 50 Shades of Ashley, Party Teal Dawn, Blushing With Excitement, Lavender Love, and Thank You Berry Much will be available in Sally Beauty stores in April.